I like this quote because it tells me that we have to keep moving forward. I am proud of all the things that our company was able to accomplish this year but I have an eye on the future. You might be able to tell that I am actually getting excited that our company is going start our Hoshin Planning for 2011. Let me correct that a little – we already have our long-term plan, we are going to make our adjustments and plan our strategy for 2011. I am glad that we use Hoshin Kanri as our method for planning. It has really helped us with the “Shiny Object Syndrome”, you know the thing that gets your attention and leads you off your chosen path. Now I’m not against changing course when required; I think every company has to at one point or another. What I am talking about is putting resources (time, people, and budgets) into something just because it seems urgent. Remember, there is a difference between what’s important and what’s urgent. Have you ever had the experience that you thought something was very urgent, but you just couldn’t get to it or finish it? Them you realize a couple of days later that it wasn’t that important after all? I know this has happened to me more than once so that’s probably why I like having our plan to refer back to. While visiting a company last week, the president asked key members of his staff “How should we communicate why we are pursuing Lean as one of our strategies?” I think the team came up with a great answer. The company had just recently completed its Values, Vision and Mission (VVM). When they were asked “Why should we do Lean?” the answer was in their VVM. This really made an impression on me because they had something very tangible to refer to. They had their VVM printed on nice posters hung in prominent locations around the facility. 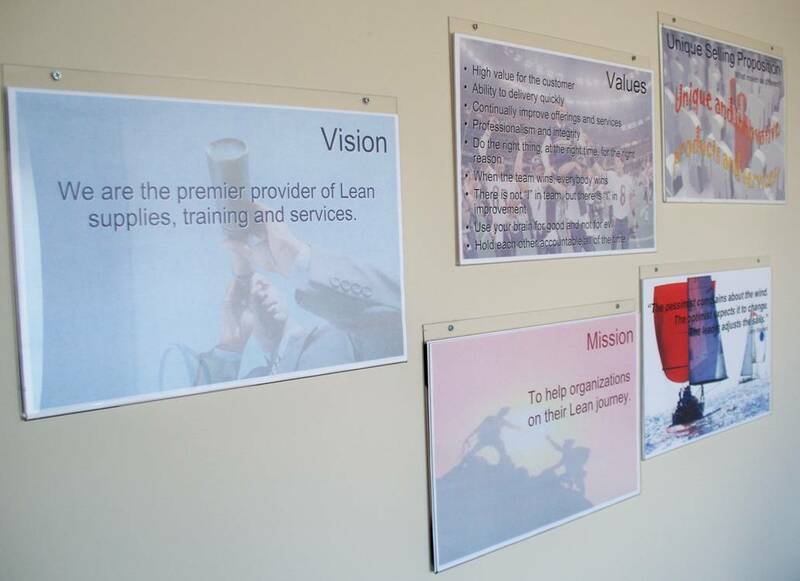 At 5S Supply we have our Vision, Mission, Values posted right in our entryway for everyone to see when they come in. We even have a little ritual to recite one of these as you walk in to help reaffirm them in our own minds. So as we get closer to our planning session, it is important to think about the “Why” that you are in business. Take a look at your Values, Vision and Mission. Do you think they fit for your organization? Are they current? Does everyone live these? To help you get your Hoshin Kanri going, we are offering a Free Webinar – Hoshin Promotion on September, 22 2010. Also, you can check out an article I wrote that was just published in ASQ’s Six Sigma Forum Magazine titled Hoshin Promotion.